Casey’s General Stores, Inc. (CASY), together with its subsidiaries, operates convenience stores under the Casey’s General Store, HandiMart, and Just Diesel names in 11 Midwestern states, primarily Iowa, Missouri, and Illinois. This dividend achiever has paid dividends since 1990 and increased distributions on its common stock for 12 years in a row. The company’s last dividend increase was in February 2012 when the Board of Directors approved a 11.10% increase to 15 cents/share. The company’s largest competitors include Weis Markets (WEIS), Supervalu (SVU) and Fresh Market (TFM). 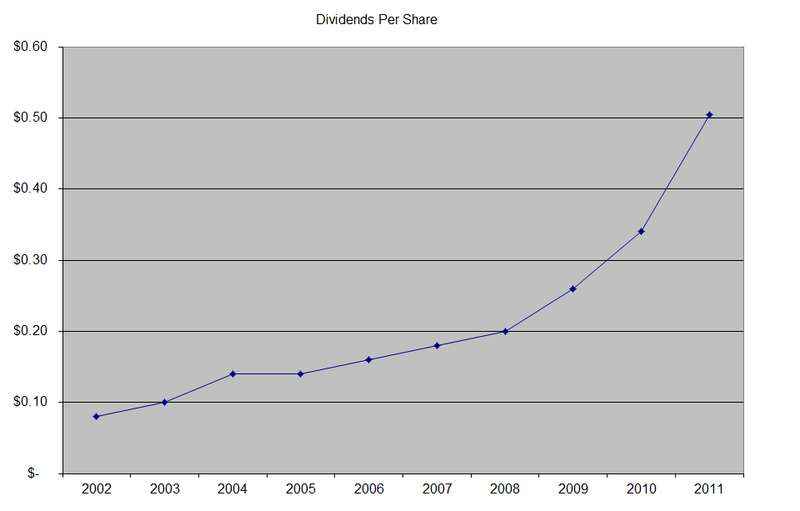 Over the past decade this dividend growth stock has delivered an annualized total return of 18% to its shareholders. The company has managed to deliver a 14.80% in annual EPS growth since 2002. Analysts expect Casey’s to earn $3.11 per share in 2012 and $3.54 per share in 2013. In comparison Casey’s earned $2.22/share in 2011. The improved financial performance at Casey’s has been driven by increase in number of store locations, increase in in-store promotional activities as well as implementation of a product mix with higher profit margins. The company grew by 109 stores in 2011 to 1,637 stores. It currently has a presence in 11 states, although just four states account for the majority of store locations. As a result, the number of Casey’s stores is far from saturated. The company grows the number of stores through purchasing existing locations from competitors or by building new stores. The company’s goal is to increase number of stores by 4% - 6% per year. The company is also expecting to spend significant amounts on renovating a large number of stores, in an effort to increase its appeal to customers, and increase foot traffic. Gasoline accounted for 71% of Casey’s sales in 2011, but 24.10% of gross profits. Higher gasoline prices over the past three years have led to higher sales and higher profit margins. The company’s grocery and other merchandise accounted for 21.20% of sales, but 43.70% of gross profits. Prepared foods and fountain segment contributed 7.40% of revenues and 29.30% of gross profits. Although gasoline only accounts for a quarter of gross profits, it brings in customers, who are then more likely to come in the store and purchase some of its high margin products. Casey’s has been under increased pressure in its prepared foods, as bread, meat and cheese prices have been increasing, and it has been unable to pass on price increases to consumers. Casey’s business is seasonal, and generally the Company experiences higher sales and profitability during the first and second fiscal quarters (May-October), when customers tend to purchase greater quantities of gasoline and certain convenience items such as beer and soft drinks. Approximately 60% of all Casey’s General Stores are located in areas with populations of fewer than 5,000 persons, while approximately 15% of all stores are located in communities with populations exceeding 20,000 persons. The company has calculated that its stores can be profitable even if it operates in communities with as little as 500 persons, as long as there isn’t any competition. Casey’s operates a central warehouse, the Casey’s Distribution Center, adjacent to its Corporate Headquarters facility in Ankeny, Iowa, through which they supply grocery and general merchandise items to our stores. The Company owns the land and the buildings behind 99% of its stores. In the past year, Casey’s rejected an unsolicited bid to acquire it, and spent a considerable amount in legal fees as well as fees related to its recapitalization program. These one-time items amounted to 41 cents/share. Without them, EPS would have been $2.65 in 2011. As part of that program, Casey’s was able to repurchase $500 million worth of its stock at an average price of $38.25/share in 2011. 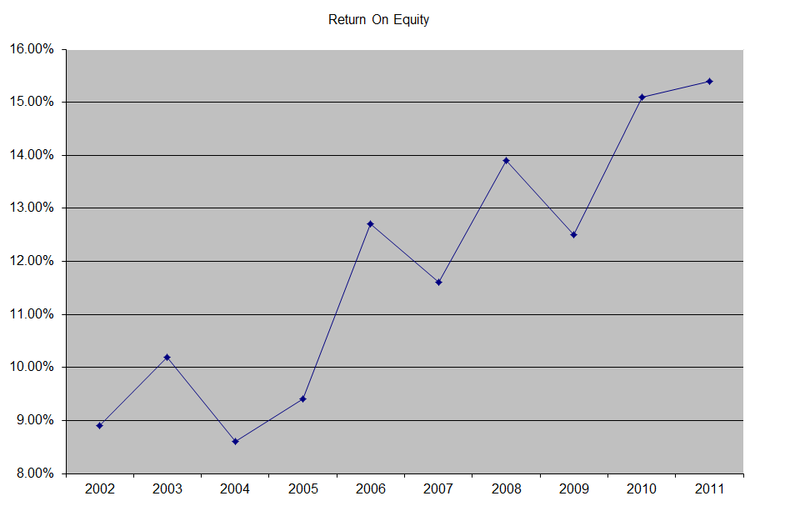 Casey’s has managed to earn a higher return on equity over the past decade. In fact, this indicator increased from 9% in 2002 to 15.40% in 2011. Rather than focus on absolute values for this indicator, I generally want to see at least a stable return on equity over time. The annual dividend payment has increased by 21.70% per year over the past decade, which is higher than to the growth in EPS. This has led to an expansion in the dividend payout ratio for the company. 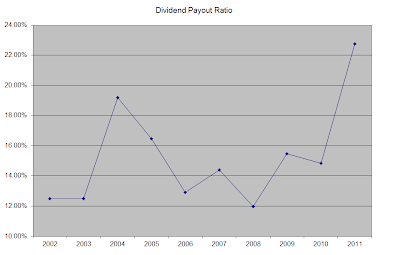 A 22% growth in distributions translates into the dividend payment doubling almost every three and a half years. If we look at historical data, going as far back as 1990 we see that Casey’s has actually managed to double its dividend every four and a half years on average. 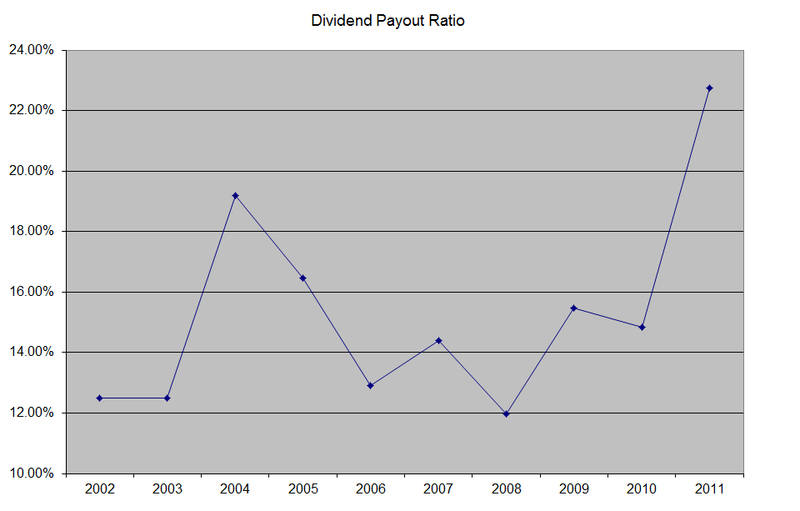 The dividend payout ratio has increased over the past decade, rising from a low of 12.50% in 2002 to almost 23% in 2011. This explains the fact that dividend growth has been faster than earnings growth over the past decade. A lower payout is always a plus, since it leaves room for consistent dividend growth minimizing the impact of short-term fluctuations in earnings. I have been familiar with Casey’s since at least 2008, and have purchased gasoline and some of its in-store products from them. Their pizzas are good, and some customers I have spoken to go out of their way just so they can buy them. I never really researched whether Casey’s is even publicly traded, until it popped up during my weekly reviews of dividend increases. While stock price has increase significantly over the past decade, I still believe that there is room for growth. However, if the company gets acquired, investors would be giving up their share of potential future growth. Currently, Casey’s is attractively valued at 18.70 times earnings, and has an adequately covered dividend. It only yields 1.10%, which is too low per my entry criteria. I do realize that some of the great growth stories end up yielding little, but could more than compensate for that through strong total returns over time. I added a quarter position in this stock on recent weakness over the past month. Companies like Casey’s have the potential to be a multibagger over the next few years.